Top quality fabric and construction with an ergonomic fit to allow for diverse functionality. In full disclosure, until just recently, I knew nothing about the Fjallraven brand. I am well-versed in most other outdoor oriented brands that are common in North American (Arc'teryx, Patagonia, The North Face, Mountain Hardwear, Marmot etc.) and even some European-based companies (Millet, Norrona) but had not been introduced to the Fjallraven brand until I read an article from a trusted source on mountaineering. 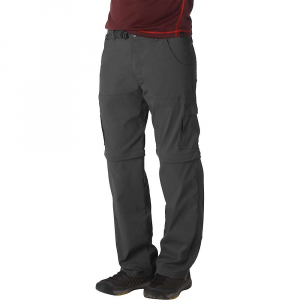 In the article, the author raved about his trekking pants — the Fjallraven Keb Gaiter Trousers. I was intrigued; not only because I am a self-diagnosed gear junky, but also because I such glowing reviews generally attract my attention. I decided to research further. My search led me to the Fjallraven website. Fjallraven is a Swedish company that has been manufacturing outdoor equipment for the last 60+ years, starting with trekking backpacks and evolving and expanding their product catalog to tents, jackets and other outerwear. The company’s claim to fame is their G-1000 fabric, a cotton/polyester blend canvas that is extremely durable, functional and adaptable (more on that later) in various outdoor environments. My interested was peaked. I decided to purchase a pair from one of my favorite online retailers. I opted for a different model than the ones reviewed: Fjallraven Greenland Jean. My decision to order the Greenland Jeans pertained more to the fact that I thought they would have more versatility in the occasions in which I could wear them. The Keb Gaiter uses a two-tone scheme whereby the areas with extra reinforcement were a darker color than the plain panel sections. 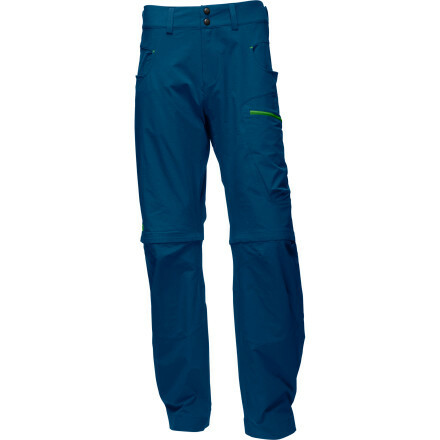 Also, the Keb Gaiter pants do not have back pockets. 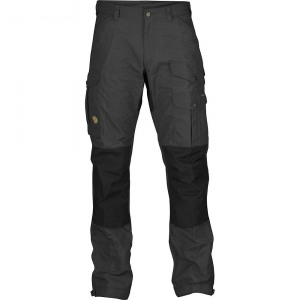 I wanted a pair of pants that I could wear in both work/social settings as well as on trekking/hiking/climbing expeditions. While the pants I ordered are a different model, the material is the same: G-1000. One critical point — the Fjallraven sizing is strange from the standpoint of a North American, used to the typical 30”/32”/34”… S/M/L sizing that we use. Fjallraven uses a European based sizing scheme. Thankfully, they provide charts to help in the conversion to North American sizing. I am 5’10”, 155 lbs with a slim frame. For pants, I generally wear North American size 30”/31” waist and 30”/31” length depending on the brand. According to the conversion chart provided, that sizing aligned with the Fjallraven 46, which was the size that I ordered. 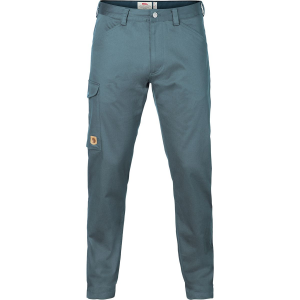 Fjallraven pants come in a fixed-length. 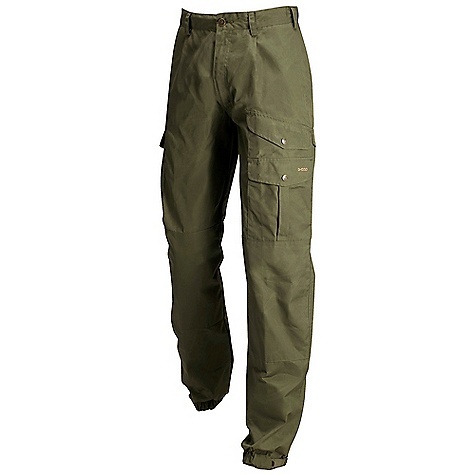 Many of the pants have a closure/clasp system at the leg cuff for fixing above, below or over various types of boots and footwear, requiring a fixed pant length. 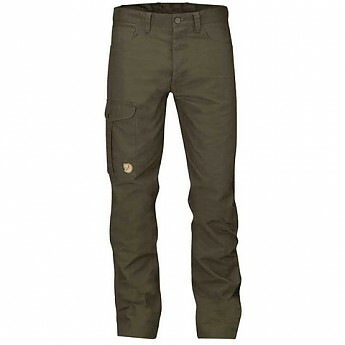 While the Greenland Jeans do not have this feature, Fjallraven still uses the fixed length. I received the pants and immediately opened them to try them on. The waist was a terrific fit — probably closer to 31” than a 30”. I would characterize the length as being somewhere between 33” and 34”. While the length is long for my dimensions, the fabric of the pants prevents them from bundling at the cuff in an annoying fashion. I believe hemming the pants would be an easy fix, however I do not see it as being necessary for myself. 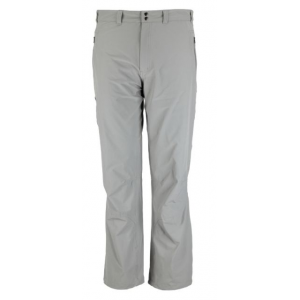 The fly has a riveted button closure and the belt loops are thick and extremely sturdy. The pocket scheme is classic 5 jean pockets – two hand with one thin inset pocket and two oversized back pocket. 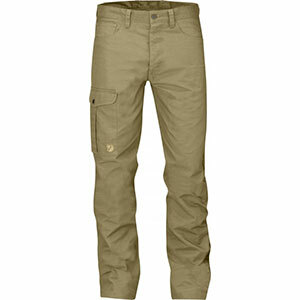 The pants also include one, pleated cargo pocket with an inset webbing/bungee area for securing a phone or GPS device. One cool feature of the G-1000 canvas is that it has the ability to be impregnated with the Fjallraven Greenland garment wax for superior water and wind resistance. Fjallraven sells bars of the wax. Simply rub the wax on the areas of the fabric where you want the additional protection, iron in and you’re set. The wax can then be washed out easily in a single wash/rinse cycle. While I have not tried this yet, the ability to reinforce key areas like the knees and the seat is very appealing. The pants are expensive. As a matter of fact, just about all Fjallraven products are expensive. I believe that you generally get what you pay for, and in outdoor equipment, that stands true about 90% of the time. I believe these pants have the ability to live up to their price. I’m so satisfied, I’ve purchased a second pair. I would highly recommend Fjallraven to anyone interested in strong, durable outdoor clothing.